In an effort to encourage the use of FCTV – Public Access Channel 13 by candidates for election, I want to share with you the FCTV policy regarding candidates and the use of Channel 13, including the availability of the FCTV Community Bulletin Board for one page which may be changed out weekly. If you would like to send a jpeg, we would be happy to place it on the FCTV – Public Access Channel 13 community bulletin board. This would be similar to an ad you would place in the newspaper but we recommend using color and there is no cost for this service. Please be advised the FCTV‐Channel 13 bulletin board runs during non‐programming hours and slides are random, although we will program candidate slides to run between approximately every 15 pages. You may email me a 544px by 442px jpeg and I will acknowledge receipt. You are also welcome to use FCTV‐Channel 13 to air programming which specifically endorses your candidacy. You can either provide us a completed program on DVD or use FCTV facilities and equipment per our policies which I would be happy to discuss with you. Primarily you need one or more production‐trained FCTV members who will serve as producer (unless you are an FCTV member in which case you may serve as producer) and volunteer crew to run the equipment. If you would like, we can attempt to find a volunteer producer for you. Please let me know and we will publicize that a producer and/or crew is needed for a particular candidate. All programs endorsing a specific candidate or ballot question must be received no later than 2:00 pm, fourteen days prior to the election in order to be scheduled for cablecast on Public Channel 13 the following week. Programs submitted after the deadline will not be scheduled for cablecast. All programs on Public Channel 13 are aired on a first‐come, first‐served basis. All programming endorsing a specific candidate or ballot question will end 24 hours prior to an election. Forums to which all candidates have been invited do not apply to the 24 hour rule. FCTV is non‐partisan, therefore we do not produce programs endorsing specific candidates or ballot questions. Our staff does provide technical support to all member producers to ensure the highest production quality of all programs. 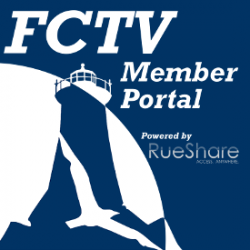 As your local community channel we encourage you to use FCTV to express your views and enlighten our voters. Since all programs as they are cablecast on Channel 13 are also streamed on our website during playback, these programs are available to non‐cable subscribers as well, thus increasing exposure. A. The public access channel bulletin board will be made available (one page per week) for individual use by political candidates for office. Such use will begin forty‐five (45) days prior to a primary, local or general election day. B. In order to allow opportunity for response, programming endorsing or opposing any particular candidate, referendum question or Town Meeting Article will end twenty‐four (24) hours prior to Election Day or Town Meeting, as applicable. C. Public Meetings such as Town Meeting, Board of Selectmen, School Committee, Planning Board, etc. are not considered Political Programming and are not subject to the "24 hour" rule. D. FCTV will mail a letter to candidates for local offices (which represent Falmouth) ℅ the mailing address submitted when papers are filed and to petitioners of Town Meeting petition articles. Offices to include: State Senate, State Representative, County Seats representing Falmouth, Selectmen, Library Board of Trustees, School Committee, Town Clerk, Housing Authority, Planning Board and Upper Cape Regional Technical School. E. FCTV will post the information contained in the letter on FCTV‐Public Channel, via social media and on FCTV’s website. The Government Channel is a conduit of and voice for elected and appointed officials and departments of government to inform our citizenry. As the Public Access Channel is for the public and the Educational Access Channel is for the constituents of the Schools. We as an organization understand the magnitude of the responsibility of Government Access and furthermore understand that our role in managing the Government Access Channel is to provide information to the public and not to persuade. There are many municipalities that are managing Government Access Channels around the country (not organizations such as FCTV) that may not necessarily hold these values in such high regard and report only their position. However, since FCTV is the management entity and holds high standards in parity and access to factual information, we strive for a more balanced approach in informing the public so that they may make the best decision for themselves upon entering the voting booth. We look forward to working with all of our candidates as well as those endorsing the many diverse points of view in our community in utilizing public access television as our community’s electronic soap box and one of several avenues available in educating and informing our citizenry.